Whether it’s a half-eaten lunch returned from school, or a supper plate still full of vegetables and meat, parents often become frustrated by their children’s eating habits. Parents may describe their children as “picky” eaters or worry that they aren’t getting enough nutrition. It is not uncommon for parents to give in and offer less healthy foods in an effort to get their children to at least eat something. The truth is that children’s appetites fluctuate day to day. While we may have an expectation of how much our children should be eating, we need to trust that they are following their own hunger cues. Only the child (and not their parents) can decide if, and how much to eat of the food and beverages offered. As a parent, it is important to honour that division of responsibility. By persuading our children to eat more than they want, we undermine their own hunger and satiation awareness. And yet, as parents, we too have responsibilities to help ensure our children obtain good nutrition. Parents are responsible for what food and beverages are available to their children. If your child opens the cupboard to see it full of chips and cookies, they (much like us adults) are going to be tempted by those yummy treats. If, however, those less healthy foods are not regularly available, your child will be more willing to eat healthy foods. Keep a bowl of washed and ready-to-eat fruit sitting out on the kitchen counter or set out a plate of cut up vegetables with some dip around snack time. Healthy snacks help children obtain adequate nutrition, so make healthy foods available for both meals and snacks and you’ll be setting the stage for healthy eating. Make one meal that the whole family can enjoy and offer a variety of foods at each meal. Include three to four food groups from Canada’s Food Guide at each meal. Avoid making a separate meal or offering alternatives for your “picky” child. They will learn to accept the family foods, if that is what is consistently available. As a parent, you are also responsible for deciding when food will be offered. Children (and adults) thrive on consistent meal and snack times. Space your snacks at least 2 hours prior to meals to ensure your child has time to build up their appetite again before mealtime. Your final responsibility in the feeding process is to establish where food is offered. Eating at the table, as a family whenever possible is important. Keep distractions like toys, television, and other electronic devices (yours included) away from the table. Children and adults should not be walking around eating unconsciously, nor should parents be intentionally distracting their children in an effort to get more food into them. Keep in mind that children are naturally resistant to new and unfamiliar things. Food is no exception. It takes multiple exposures to new foods before children will accept them. If a child sees you eating something, they will be more likely to try it. Children like to use their senses to explore a new food prior to tasting it. Give your child the opportunity to look at, feel and smell new foods before putting them into their mouths. Often, we give up too early and assume that just because our children did not enjoy the food the first time, it will never be accepted. 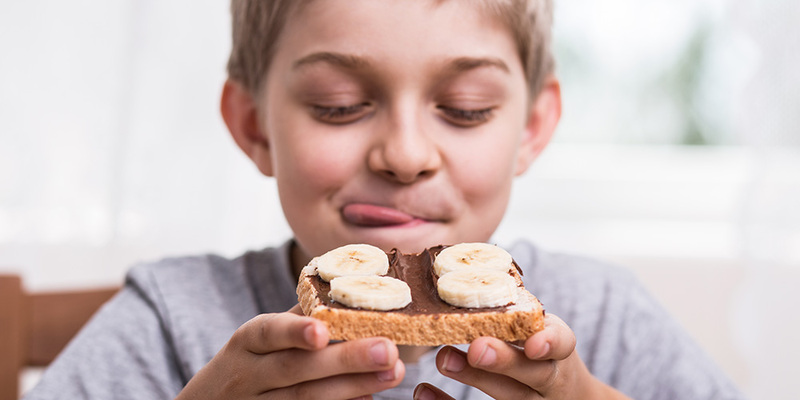 Children’s taste buds are changing all the time – continue to offer new foods in different ways in a relaxed and non-judgmental environment. You’ll be surprised what foods your children eventually will come to enjoy. Involving your child in meal planning and preparation is another great way to expose them to foods. Finally, keep in mind that children’s tummies fill up easily, so avoid offering sweet beverages or excess milk throughout the day, which can compromise little appetites. Water between meals is recommended. Limit fruit juice to ½ cup per day and milk to 2 cups per day. Keep meal times relaxed and avoid using food as a reward or punishment.